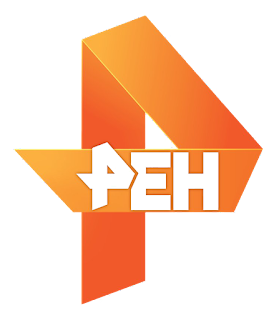 REN TV or РНН ТВ ( Russian ) is a Russian federal television channel that began broadcasting in January 1997. It is one of the largest private television channels in Russia, founded by Erna Lesnavskaya and her son Dmitry Lesnavsky. The channel won 13 Russian Academy of Television awards . The network broadcasts through 406 broadcasting companies and broadcasts to 718 communities across Russia from Kaliningrad in the west to Yuzhno-Sakhalinsk in the east. The channel is considered an entertainment television channel, jointly owned by the government and private investors from National Media Group. The channel broadcasts to 114 million viewers in Russia and to 181 cities throughout the former Soviet Union . Many brand changes occurred during the life of the channel. The channel recently announced a new concept for young people, under the motto "new dimension" (новое измерение), so that in the new logo of the channel, the signal "Р" will be replaced by reverse digit 4.